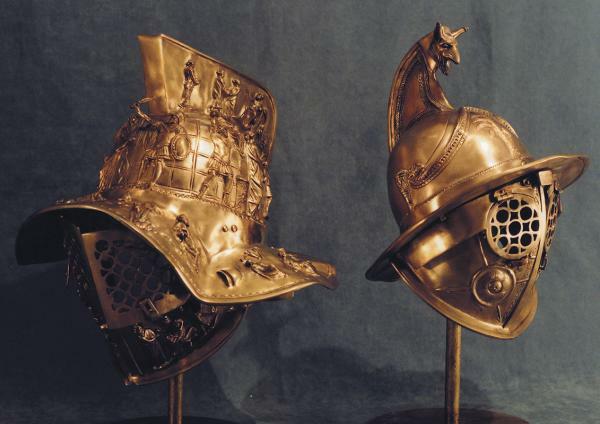 The exhibition “Gladiatores Agony and Sports – Weapons and Armor of the Roman Empire” proposes an emotional and engaging journey in the world of ancient gladiators. The word gladiator comes from the Latin word gladius (sword). Gladiatoral games were very popolar in Ancient Rome and in the Roman Empire. The exhibition,organized in six different sections, traces the history of the gladiatorial weapons and armour from the fourth century BC until the beginning of the second century A.D. You will discover the various typologies of gladiators, the different types of weapons and armor used in arena sports: spears, helmets, swords, shields, greaves, belts, protection sleeves and much more.